Just think of how you can impress your guests as they dry their hands in style with our personalized fingertip towels!! Use them in the guest bathroom, your own bathroom or even in the kitchen, or wherever you need a smaller sized (13x18) towel. 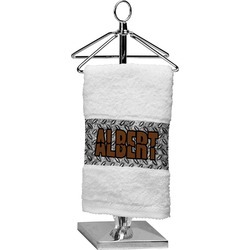 The towels are 100% plush, soft cotton terrycloth loop and are personalized on the bottom strip (2.5" high) with your designs . Whether you need one or two name, we've got you covered. We also matching bath towels. You can also use the full print hand towels or full print bath towels to mix, match and create a georgous towel set!! Browse our bathroom section for shower curtains, bath mats, waste baskets and many other bathroom accessories! Towels are soft and nice bright colors! Wish the lettering was a little larger but still adorable and make great hostess gifts. Will definitely order again! Very good material and sewing. But the "red"was brown. Definitely not red. I was disappointed in that. Love the fact that you have so many color choices. Personalization with three letters was perfect. Looks great in the kids' ocean themed bathroom.